A confident remaster of a true classic. The puzzles have aged badly, but the sparkling humour and world design still shine. What is it? A touched-up re-release of LucasArt's 1998 adventure game about a travel salesman in the land of the dead. Reviewed on: i5 quad 3GHZ CPU, GTX970 GPU, 16GB RAM. You are Manuel Calavera, a hispanic Humphrey Bogart tasked with selling travel packages to souls passing through the land of the dead. You work for a firm of skeletal salesmen who travel to the land of the living in cowls to reap new clients, but something's crooked. Saintly souls who ought to qualify for fast-track tickets on the Number Nine train are being cheated and forced to attempt the gruelling four-year walk through the land of the dead alone. When this fate befalls the angelic Meche Colomar, Manny can stand by no longer. The conspiracy must be undone. Objects must be clicked on. Inventories must be filled. Puzzles must be solved. Grim Fandango's setup is as exciting today as it was in 1998 when LucasArts was at its peak. 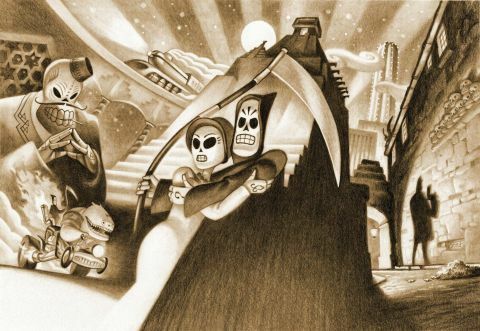 Its status as a technical achievement has faded since, but the humour still cuts, the performances still shine and Grim Fandango's vision of the afterlife still stirs the imagination. The art mixes film noir and Mexican Day of the Dead iconography with Aztec and Egyptian influences in strange and beautiful ways, and while the remastered version does little to improve on the hazy 3:4 ratio backdrops—the widescreen mode merely stretches the image to fit your screen—the vision alone makes the journey worthwhile. An optional point-and-click interface fixes the original's glaring control issues. It's disappointing that the backgrounds haven't had a retouch, but not unexpected, and the rest of the remaster is good. The 3D models have been faithfully retextured, and look much better at modern resolutions thanks to revamped lighting in every scene (you can switch between the original models and the remastered versions in the menus). Characters cast long shadows across the static old backgrounds, which give the streets of Rubacava extra film noir cred. An optional point-and-click interface fixes the original's glaring control issues, and there's an optional director's commentary that lets you trigger anecdotes in most scenes. I'd only wish for a three things: autosaves, a replacement for the laborious inventory system and a hint system. Without in-game hints, I'd advise that you have a good walkthrough an alt-tab away. If this is your first Grim Fandango playthrough, enjoyment will depend heavily on your tolerance for outdated adventure game design. The old-school adventure game format is a great delivery system for jokes and inventive worlds, but it means grappling with puzzles puzzles that are boring or illogical, often both. Grim Fandango has some real stinkers. When trapped in the engine room of a boat, your first instinct probably wouldn't be to use the ship's anchors to tear the ship in half so your half can fly off into the sunset. That is something that could never happen, but that's the leap of logic Grim Fandango demands. Likewise you may work out that the flaming bone beavers of the petrified forest need to be extinguished with your fire extinguisher, but the idea of throwing a bone so you can extinguish them as they dive fatally into a tar lake isn't likely to occur. Why does being on fire stop them from sinking in tar? Grim is rife with puzzles like those. There are sections—the petrified forest is a case in point—that should be skipped through as quickly as possible. While it may seem strange to recommend cheating your way through elements that make the game challenging, but the joy of Grim Fandango lies elsewhere, in the world, and the wit of its inhabitants. It's rare that a game compels me to exhaust every last line of enquiry with every character. Grim Fandango's dialogue trees are little treasure chests that dispense gags, movie references and sudden poignant moments with outstanding generosity. It's brilliantly funny (in a grotty hotel bar skeletons in turtlenecks and berets improvise revolutionary poetry. "ah, Deadbeats!" Manny quips), but it's sad also. Even with a clean state Grim's citizens trap themselves with freshly invented baggage. They chase fame, money and influence out of sheer force of habit. Their purgatory is self-imposed. Grim Fandango's blend of comedy and fatalism is best embodied by Membrillo, the coroner who tends to 'sprouted' victims in Rubacava's morgue—"We may have years, we may have hours, but sooner or later, we push up flowers." If it had been technically possible at the time, I can imagine Grim being the Jazzpunk of its day, a series of quips and scenes linked by moments of cute interaction. As it is the puzzles provide a bit of friction to expose you to each location. Absorb the ambience. Drink it in. The poor puzzles have eroded the score, but you're getting a PC gaming great for £11 / $15. May this classic never die.